On Ryan Conklin‘s MySpace blog, he had written on April 16th and again on June 8th that he would be seen again on television. With the certainty he had in stating it, it wasn’t hard to deduce that something was in the works, presumably MTV doing a special on Ryan’s deployment to Iraq. Then more recently, there was a curious situation of Ryan suddenly adding two more people to the small list of those he followed on Twitter, one of whom (Matt Ruecker) was a producer for The Real World Brooklyn. Both of the two new followings had written about being in Baghdad recently for a short period of time. Now it has been revealed that yes in fact MTV had been taping Ryan’s training while stateside and also his Army life and experience in Baghdad. It’s for a followup story of what has happened to Ryan after The Real World ended and he went back to active duty. It will include scenes of what Ryan’s life is like at Joint Security Station Saydiyah near Baghdad and will show him at work as an infantryman patrolling Baghdad’s Saydiyah neighborhood. The MTV Ryan Conklin special Return To Duty will premiere on November 11th, 2009. It’s not surprising that MTV would want to do an additional piece focused on Ryan Conklin. During the run of The Real World Brooklyn, the viewers were charmed by the personality and wit of this engaging young man, and were heartbroken as they watched his life turned upside down with the sudden notification that he was being recalled to active duty in the Army. People watching the show grew to have a great interest and affection for him, and after the show ended they continued to want to know how well he was faring. 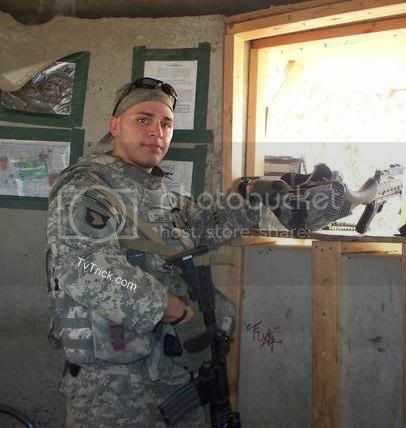 At the moment, as every loyal fan knows and can recite from memory, Ryan is currently serving with the North Carolina National Guard, in Company B, 252nd Combined Arms Battalion, 30th Heavy Brigade Combat Team. It will be heartwarming to see Ryan back on television, showing in new ways what an amazing person he is. Click on the link for more about Ryan Conklin in Return To Duty. This entry was posted on Tuesday, July 7th, 2009 at 7:35 pm and is filed under Ryan Conklin. You can follow any responses to this entry through the RSS 2.0 feed. You can leave a response, or trackback from your own site. I’m deployed to Iraq with Mr. Mtv. I have been to JSS Sadiyah. Spc. Conklin is falsifying details to promote himself. My brigade, Spc. Conklin’s brigade, has lost 7 soldiers so far. Nowhere on here pays honor and trbute to them, but you want to glorify this guy. Yes, he is in an infantry company, but this is not 2003 or 2004 when we were fighting enemy personel. So I guess his ease of life here or as he would say a rough and deadly place only matters to you all because of his stint on tv. I just hope Spc. Conklin’s sarcrifices touch your little hearts. Some people do this for love of your country. I guess he does it for stardom. But in actualality, he is no better than any soldier here. I can point out the “high speed ground pounding heroes” and Spc. conklin isn’t one of them. So Spc. Conklin I really hope you get to endulge in your 15 minutes of fame. Just be honest to the folks back home buying into your crap. They don’t deserve to be lied to. Maybe you need to look in the mirror and ask yourself is what you’re doing really helping or is it hurting. Scaring wives back home, who actually believe your lies. Is that worth it to you. If it is then you are certainly not a warrior or a member of a team. You might want to think about that before you tell your next lies.